Recommended to: Readers who enjoy deep stories, with a lot of character introspection. 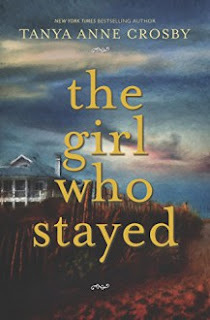 The Girl Who Stayed is billed as a mystery/thriller, but trust me when I say that it's so much deeper than that. This is the story of Zoe Rutherford's return to her childhood home of Sullivan's Island. A place of memories, most of them unpleasant. What begins as a quick trip to clean and fix up her childhood home, quickly turns into an introspective look at Zoe's life. Be warned, there are a plethora of emotions here, with childhood and adult abuse mixed in. This isn't the easiest story to read, but it was definitely more intriguing, than I expected it to be. Zoe's head is a tough place to be. She's a prickly, and initially rather unlovable character. There's a wall miles tall between her and everyone else, set in place to protect her from more hurt. The fact that she obsesses over the same things, in an endless loop, makes for a tough read at times. As her abuse at the hands of both her father, and her recent ex-boyfriend started to come to the surface, I began to understand her more. It takes a lot of guts to finally walk away from something so damaging. Zoe ended up being stronger than I expected her to be, and I slowly grew to appreciate her for that. She may have been a bit broken, but only because she kept all the people who could have helped at arms length. The mystery part of this is two-fold. One the one hand, Zoe has never let go of the unsolved disappearance of her younger sister Hannah. Her childhood was broken enough as it was, but Hannah's possible death has never let Zoe go. Crosby slowly unearths snippets of this traumatic event, bringing the reader further and further into Zoe's mind. When the second part of the mystery is presented, which I won't spoil for you, it actually fits in quite well. While I was pretty committed to this story for most of the book, the ending was what really brought it all home. This wasn't a perfect story. It dragged at times, and Zoe isn't a character that everyone is going to love. However The Girl Who Stayed pleasantly surprised me. It ended up being much deeper than I expected it to be, and well-written at that. If you're in the market for a mystery/thriller that has a contemporary feel to it, this fits that bill. It's a worthwhile way to spend a few hours.